Bush Dentistry is the leading provider of a full range of innovative, high-quality dental services that maintain good oral health, maximize dental function and improve patient quality of life and appearance. From basic dental care to dental implants and complex dental restorative services, Bush Dentistry offers complete dental care for a lifetime. We help our patients achieve their dental health goals in a warm, supportive and professional environment. For over thirty years Bush Dentistry has helped set the bar for quality dental care. 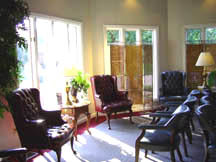 Founded in 1978 by Dr. James L. Bush, the practice quickly established the reputation for professionalism with honest, comprehensive, compassionate care at the absolute highest level. Raised on this tradition of excellence, Dr. Allen Bush joined his father in practice in 2004, making it a true family practice. Today, at Bush Dentistry, our care and knowledgeable team of doctors, hygienists, and staff carry on this legacy of excellence by seeking out the most current continuing education training, employing the finest bio-materials, and the latest technology to meet and exceed the needs of our patients and their families. As it was in 1978, we continue to make patient care a priority. We take the time necessary to reach the optimal result desired for each unique individual. We enjoy knowing our patients and their families, and honor the privilege of the doctor patient relationship that you have entrusted in us.